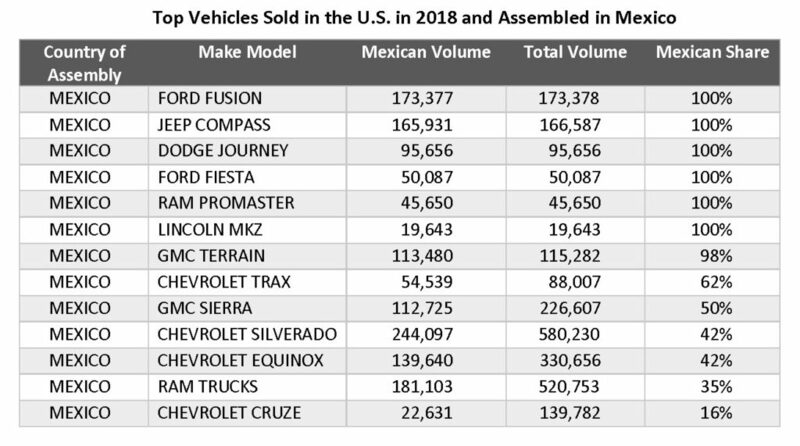 The Importance of Mexico to the U.S. Auto Market - Cox Automotive Inc.
Of new vehicles sold in the U.S. in 2018, 53% were assembled in the U.S. However, 15% were assembled in Mexico. In addition, 41% of the remaining vehicles assembled in Mexico and sold in the U.S. are from “foreign” makes with substantial manufacturing in the U.S.
By placing a new tariff on the flow of vehicles and parts from Mexico to the U.S., we are taxing American consumers on some of the most popular vehicles sold in the U.S., like the Chevrolet Silverado and Equinox, Ram trucks, GMC Sierra and Terrain, Jeep Compass and Dodge Journey. Mexico is arguably the most important U.S. trading partner for the automotive market, both for fully-assembled vehicles and, even more importantly, for parts that go into vehicles assembled in the U.S.
Of new vehicles sold in the U.S. in 2018, 53% were assembled in the U.S. However, 15% were assembled in Mexico. Japan is the second largest partner at 10%, followed by Canada. The rest of the auto-producing nations represented single-digit shares of new-vehicle sales. What is uniquely challenging about a disruption in the free flow of goods across the U.S.-Mexico border is how heavily American-based manufacturers depend on Mexico for final assembly. There is no Mexican make sold in the U.S. 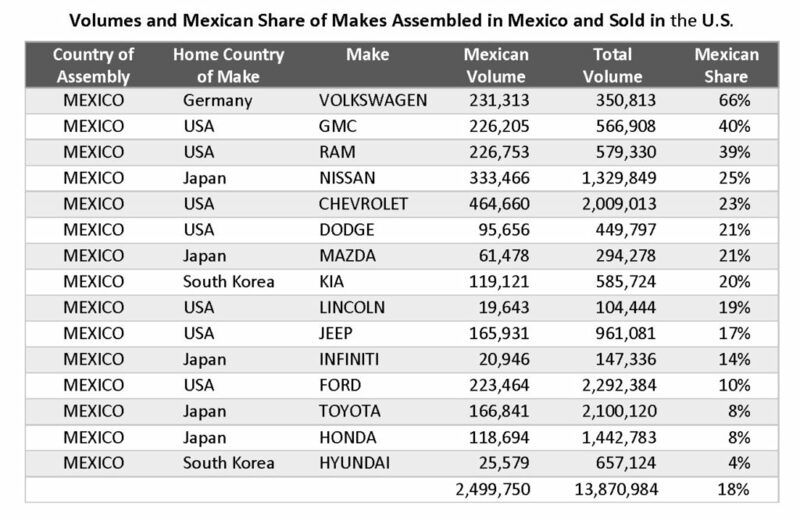 The majority of vehicles assembled in Mexico come from American brands. 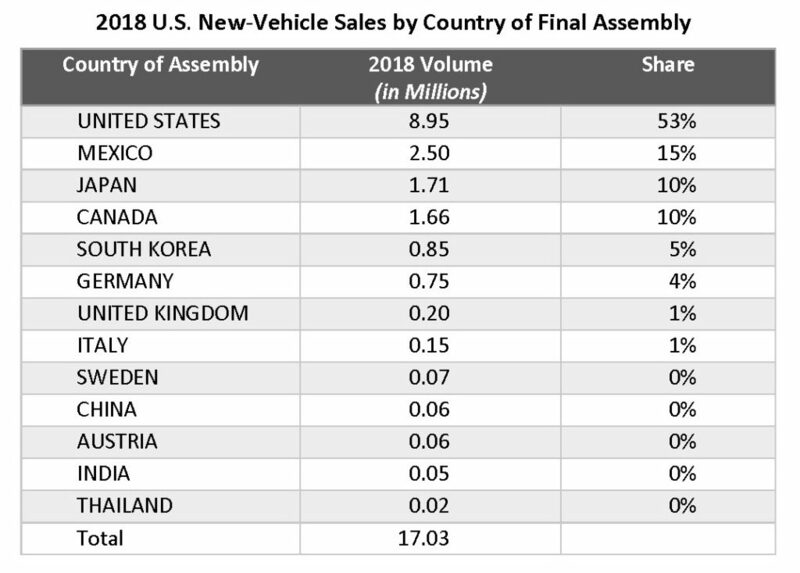 In 2018, Mexico assembled 2.5 million vehicles that were sold in the U.S. Of those “Mexican vehicles” sold in the U.S., 57% were domestic makes. Two of these “domestic” makes – General Motors’ GMC brand and Fiat Chrysler’s Ram brand – see about 40% of their U.S. sales coming from vehicles actually assembled in Mexico. In addition, 41% of the remaining vehicles assembled in Mexico and sold in the U.S. are from “foreign” makes with substantial manufacturing in the U.S. These brands are Volkswagen, Nissan, Toyota, Honda, Mazda, Infiniti, Kia and Hyundai. In fact, 15% of the total U.S. sales from these foreign makes come from vehicles assembled in Mexico. Two-thirds of the Volkswagens sold in the U.S. last year were assembled in Mexico. Given proximity to U.S. operations and likely synergies, these vehicles otherwise considered American, Japanese, German and Korean likely have a larger percentage of content coming from the U.S. from their related factories based in the U.S.
For more details, read my opinion piece published on April 9 in The Hill.